The first convention of the United Association was called to order Monday, July 28, 1890 at 11:20 a.m. with Brother President P.J. Quinlan in the chair. Plumbers Local Union No. 8 of Kansas City, Missouri first delegate to this historical convention was Brother William F. Coakley. The records indicate that Brother Coakley attended subsequent conventions with his last attendance being September 1908. In the beginning of Plumbers Local Union No. 8, officers served for six (6) month terms with little or no pay. Probably working at the trade and also serving the local as an officer. From its infancy Plumbers Local Union No. 8 has had a steady growth of membership. Since 1956 the term of office has been increased to three (3) years. The meeting hall and business offices have been at the following locations: 1112 Locust Street, 14th and Woodland (Labor Temple), 101 E. Armour Blvd., 8600 Hillcrest Road, and in October of 2016 Plumbers Local Union No. 8 moved to 5950 Manchester Trafficway, Kansas City, Missouri. Over the past 100 years the materials of the plumbing industry have changed. The Plumber, which according to the Merriam-Webster Dictionary means a dealer or worker in lead, has readily adapted to the changing times. Plumbers Local Union No. 8 has continued to keep abreast with the changes in material and methods of installations. This has been accomplished by our up to date training center not only made available for apprentices but also any Journeyman that felt the need to update their skills. From the time that Local 8 was first chartered, the officers and the members of Plumbers Local Union No. 8 were well aware of the necessity to train qualified people to replace members who retired, whether they were called apprentices or helpers the results were the same. The local needed to supply the industry with well trained plumbers. This training prior to 1950 was primarily confined to on-the-job-training. In the early 1950’s it became apparent due to the technical changes in the plumbing industry, that more trade related classroom instruction was needed. This not only included the training of apprentices but also for the upgrading of Journeymen. It was with this in mind that the Officers and Members of Local 8 voted to establish an educational committee, whose duties would be to instigate a related training program for journeymen and apprentices. In 1952 Brother Ed Brink appointed a seven-member committee including Virgil Chase, Robert Duffy, John Gorman, Homer Harlan, Roy Ogden, Lou Stine, and Floyd Stover. In September 1953, under the direction of Educational Director George White, the new apprenticeship classes began and were held in what was then the Manual High School (now, Manual Career and Technical Center). Committee members decided that Local No. 8 members would serve as instructors unless outside instructors were needed. It has remained that way ever since. Some of the original staff members included: Jack Davis, Harold Bloodgood, Luke Masur, Tony Privitera and Joseph Oxler. Over the next ten years, the program outgrew that space and the J.A.C. moved the program to a leased facility at 43rd and State Line Road in Kansas City, Kansas. Ten years after that the program again needed more space and the J.A.C. built its own training facility in South Kansas City on Hickman Mills Drive. George White retired in September 1988, after 36 years of service. The committee then hired Brother Bill Tarpley as the new educational director. He served in that position for 18 years until he retired in August 2006. At that time, Brother Fred Jonas was hired for that position. During his tenure, Jonas incorporated AutoCAD and daytime welding classes at the training center. Upon Jonas’ retirement in 2013, Frank Murray assumed the duties of educational director. Just like the educational directors who preceded him, Murray is working to ensure the apprentices are successful and job-ready. He has added online classes to supplement classroom training and to help free up classroom space and has added a training curriculum for Service Plumbing. Murray supervised the move of the apprenticeship program to the new building which opened September, 2016. The new facility at 5950 Manchester Trafficway will allow for more course and expanded training. Examples include three additional certifications that will be taught: MO Propane Gas Certification, Industrial Rigging Certification, Scissor-Lift Certification and a new service lab. Since the beginning, Local No. 8 apprentices have worked on several high-profile construction projects and continue to help build Kansas City and the surrounding metro area. The future is bright for the apprentices of Local No. 8. The Joint Apprenticeship Committee or (J.A.C.) is in complete charge of all apprentice affairs and consists of three members from the local union and three members from the contractors association. The Educational Director works directly for and is responsible to the Committee. The Educational Committee began its revised training program in Manual High School at 1215 Truman Road in 1953 and remained there till 1963. In October of 1963 the J.A.C. leased a building at 43rd and State Line in Kansas City, Kansas and moved the training facilities there. The fact that more space was needed and they were able to use the welding shop at Manual only one night a week was the biggest factor in the decision to move. The training center remained at 43rd and State Line for 10 years, but again found themselves short of space both for classrooms and parking. The J.A.C. decided to build their own training facility at 9876 Hickman Mills Drive and moved to that location in 1973. In October of 2016, the J.A.C. moved to 5950 Manchester to expand training and added service training. Local No. 8 in conjunction with the contractors association has operated a very successful training program over the years as can be attested by their record at the International Apprentice Contest. In 1954 General President Martin Durkin established an apprentice contest to be held each year on the campus of Purdue University (West Lafayette, Indiana). The purpose of the contest was to determine the best trained 5th year plumber apprentice in the United Association. The contest consisted of a local contest to determine the best trained 5th year plumber apprentice in the local union. The local winner would then compete against the other local winners in the state contest. The state winners would gather in August of each year to complete for the International Championship. There were three places awarded to the first three contestants, not only received the prestige of the winning, but a substantial monetary award (1st place $1,000, 2nd place $500 and 3rd place $250). Considering the fact that during those 20 years there were 461 local unions in the United Association this has been a very impressive record. The International Apprentice Contest was discontinued in 1974 and has been reinstated in 2006. In conjunction with the apprentice contest there was and still is an Instructor Training Course, At Purdue University for local union instructors. The course consists of 40 hours a year for five (5) years. The instructors who successfully complete the 200 hours of instruction are awarded a completion certificate. There are fifteen (15) local 8 instructors who have completed the course. Three members of Local Union No. 8 were instructors at Purdue Instructors Training Course. They were Dave Mathany, Tom Sanders and George White. Through the years the agreements between Plumbers Local Union No. 8 and its signatory contractors have been made with integrity, fairness and the well being of the consumer and the plumbing industry as its goal. As in any relationship there have been periods of reluctance or holding back before an agreement was reached. The strike of 1954, 1967 and 1999 were examples of these times but afterwards like in any relationship there was a mutual settlement for the benefit of each party. On the 6th of August 1954 Plumbers Local Union No. 8 Health and Welfare Trust Agreement was entered into. The first Plumbers Local Union No. 8 trustees were Lawrence Parkhurst, Henry Wiese and Charles Erisman. The Employer trustees were T.G. Conroy, Ed W. Lochman and Ben Skaer. In 1958 President Brother Joe Casteldine appointed the original steering committee to look into a pension plan for Plumbers Local Union No. 8. The committee members were Ollie Dodson Jr., Robert Green, Raymon Cozad, A. O. Burt and James L. Corless Jr. The Pension Plan was adopted by the Plumbers Local Union No. 8 membership June 1, 1959. The Plumbers Local Union No. 8 trustees were James L. Corless Jr. (Chairman), Ray Cozad and Robert F. Green. 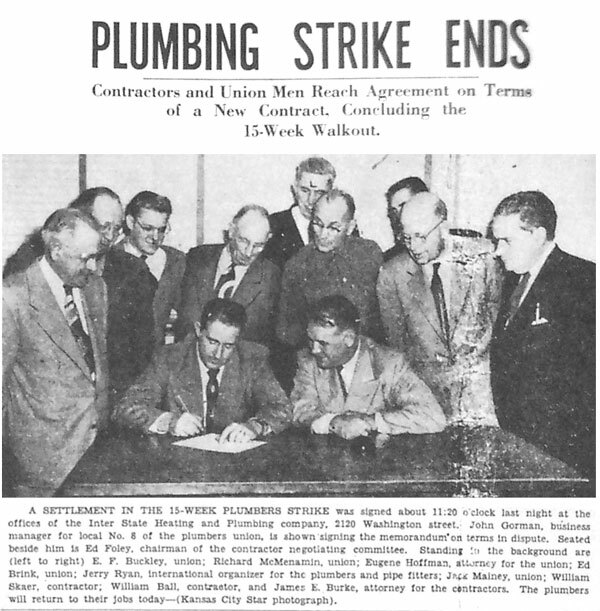 The Associated Plumbing Contractors of Greater Kansas trustees were John B. Keller (Secretary- Treasurer), Don Huxtable and Harry M. Morrison Jr. From the original contribution of $.10 per hour worked by each plumber. The first pension check was presented to Gus Oxler Sr. by James L. Corless Jr. at a meeting at the American Legion Building. Over 100 years ago, Plumbers Local Union No. 8 lost a strike that lasted from the first day of May until the 17th of July. Local 8 was asking for a ten cent per hour increase from forty cents per hour to fifty cents per hour. The Local lost the wage increase at that time but Local 8 did not break ranks and give up its commitment or pledge to maintain its goals of protecting the public from the health hazards that are contributed to installation by untrained individuals. In 118 years of Plumbers Local Union No. 8’s activity in the labor movement the names and faces have changed but like in the century that has passed Plumbers Local Union No. 8 will continue its efforts for a healthier, safer community and a decent repectable continuance of wages and fringes for its members.